Five inmates accused of being involved in a prison riot have been cleared of mutiny. Ross Macpherson, Steven Goodwin, Shane Simpson, John Udy and David Carlin were all acquitted of mutiny and violent disorder on the direction of a judge. Three of them were also cleared of criminal damage - a charge Macpherson and Goodwin had admitted at an earlier hearing at Hove Crown Court. The judge will make a ruling on those charges at a hearing on Thursday. 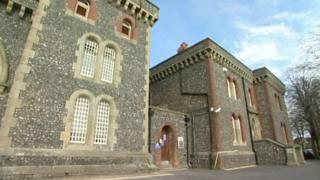 The five had all been accused of involvement in an outbreak of violence at a cell block in Lewes Prison, East Sussex, on 29 October 2016. But following representations by their defence counsel at the end of the prosecution case, the judge directed the jury to acquit them. Macpherson, 28, of HMP Belmarsh, Goodwin, 29, from Hastings, Simpson, 30, of Totton, Southampton, Udy, 38, of Portsmouth and Carlin, 26, of Kirton, Nottinghamshire, all denied prison mutiny. A sixth defendant, Benjamin Drury, 32, of HMP Bristol, was found guilty by Brighton magistrates in November of criminal damage and was jailed for four months.